Champagne was popped, glasses raised, fireworks burst, and a chorus of ‘Happy New Year’ waved off 2016 and welcomed 2017 with open arms. A lot of people were glad to see the back of 2016: it was a difficult year for many, in many different ways. It certainly had its up and downs… Whilst there was much that was good for me personally last year, 2016 did not end happily. On 28th December, my family was greatly saddened by the sudden death of my beloved Grandad. He was a remarkable man with a character almost as big as his love for motorbikes, Yorkshire pudding, and, of course, his family. He will be sorely missed by all who knew him, not least because he was the sort of man with whom you couldn’t even have a passing conversation in the pub without him leaving some sort of lasting impression. I have spent the last few days reminiscing with family, sharing stories and going through old photographs. It has been bittersweet at times but I am eternally grateful to be part of such a close, loving, and supportive family. It would be easy, at this time, to sink into sadness and dwell on our loss. But I do not think that is how he would have wanted us to live and it certainly isn’t how I want to live. I would much rather live and love and laugh in happiness, even though it might be coupled with heartache – Grandad so loved to laugh and his terrible jokes would keep us in chuckles constantly. With that in mind, I have resolved to make this year a happy one, in spite of some of the sad and difficult times ahead. 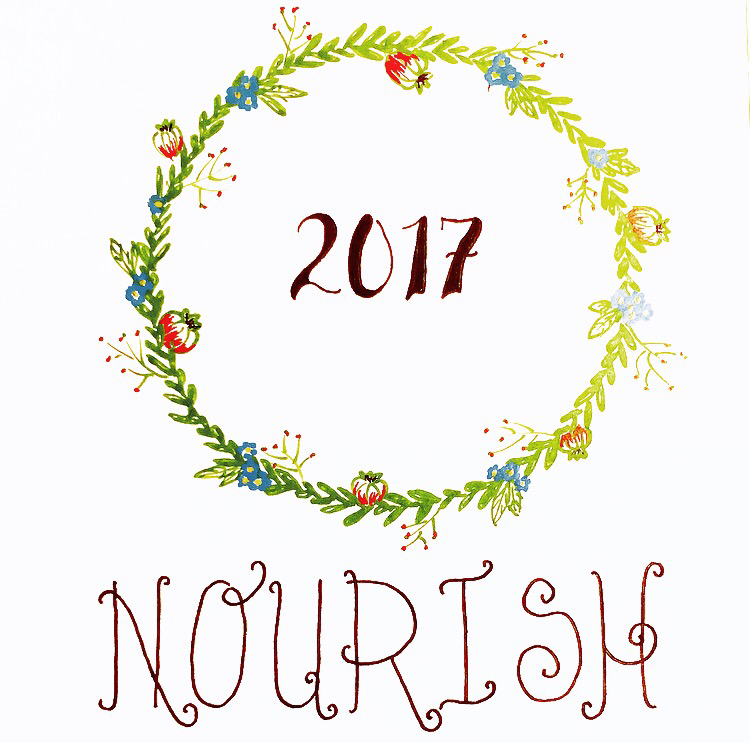 I chose the word nourish because I sometimes find myself getting overwhelmed, rushed by all the ‘should’s and ‘must’s that bombard us every day. It’s tiring and distressing and unhealthy to feel so much demand from these abstract ideas and expectations. I want to dedicate more time this year to nourishing and growing all aspects of my life to be what I want them to be, not what the media or society or anyone else tells me they should be. And more than that, I want to take more time to enjoy my life and all the wonderful people, opportunities, and ‘things’ I am blessed with. 1) To develop a more regular practice for writing, mindfulness, and self-care, in order to help me manage my anxiety and develop the skills and interests I enjoy. 2) To try to find a more balanced routine for managing our home (I’m terrible for letting chores mount up until I get frustrated and feel overwhelmed by it all), and to declutter to more easily enjoy our lovely home. Whilst there are many other things I will be investing time and energy in this year, such as spending quality time with friends and family, finishing the decorating we want to do in our house, training for my next (and final!) dance exam etc., I’m hoping these two personal goals will be nourishing for me and, as a result, will enable me to nourish the other areas of my life: family, friends, community, and work. I had no real idea what I wanted to say when I sat down to write this post, only that I needed to put into words some of what has been buzzing round my head. To express in some concrete way my intention to be happy, and find positivity, even when there is sadness in my life. Whatever you felt about 2016, whatever position you find yourself in as we begin 2017, I wish you the Happiest of New Years.